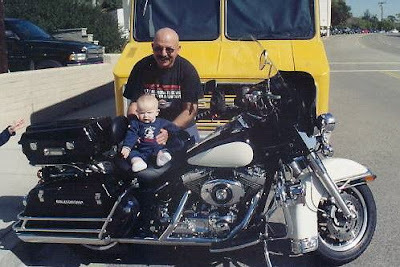 My Wandering Life: Happy Birthday Grandpa with the motorcycle! Today is my Dad's birthday and despite how far away they live, I actually got to see both my parents this morning while they were down in this area for their tax appointment. Nothing like spending your birthday at the accountant's office, huh? Sadly, they had to hit the road to get home before the boys got out of school. However, they did leave Nathan and Benjamin a fun creative toy they've been begging for, so they are happy kids. 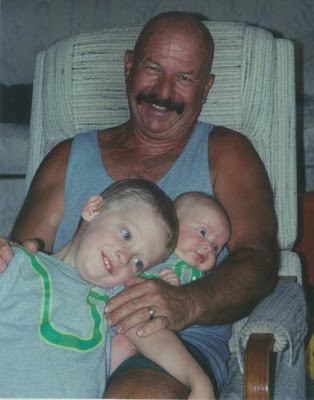 Happy Birthday Grandpa! We love you! Ben's first trip to my parent's house. He is one month old, Nathan is two and a half. Nathan and the motorcycle from which Grandpa with the motorcycle gets his name. 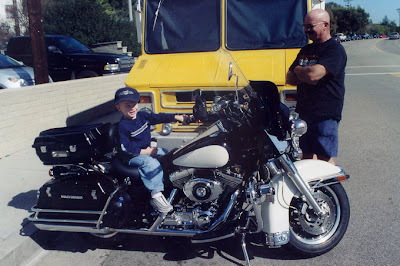 Baby Ben on the motorcycle. 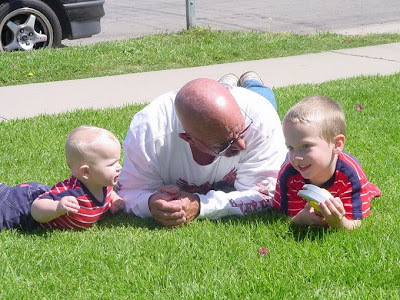 You can tell Grandpa really loves these boys, no one, and I do mean no one, is allowed to touch his Harley! And here are my sticky, slimy children sitting on it! Lucky boys! My kiddos have been asking for them, too. Yes, they have been watching too much TV lately. :o) The first kind of "bendaroos" were "wikki stix", and I found a recipe online to make them. But it involved a toilet seal wax ring, paraffin, and dipping individual pieces of yarn in the wax. Hmm, I think it would be more worth it to buy some! Oh, and there are those worm/snake shirts the boys have that I made that crazy comment about. NOT how I meant it, but I was just trying to make a point. You have to admit it is cuter times 2! Nathan and Ben can act out the entire infomercial for Bendaroos! This makes me laugh since they don't get to watch TV that has commercials so they must have seen it once and committed it to memory! Ah yes, the matching snake shirts that are really only cute when they actually "match"! I sure miss the Baby Gap outlet!